Oh I know, this post is ancient history already, isn’t it? 2014 is so three weeks ago, but the flu knocked me out for some time right after I made resolutions to not panic, so here I am on January 20 writing about last year. This is me not panicking and celebrating the movies that made me happy last year. While making this list, I realized there were dozens of films I never got around to seeing. That makes me sad, but alas it's true. If your personal favorite is missing from this list, let me know about it in the comments and I’ll be happy to add it to my Netflix queue. I’m always looking for great movies to watch! This didn’t come out in 2014, but I finally saw it in 2014. Joss Whedon once again delivers the unexpected, creating a horror film that is hysterical while also deconstructing all the tropes of a usual horror movie. People had issues with Lucy. I was not one of those people. I thought this was a fun and unexpected sci-fi story with great visuals and an intriguing lead female. The end gets a little twisty crazy, but the rest of the film is a great ride that the crazy can be waved away a little. This is the reason I don’t do my end of the year lists in the middle of December like everyone else. I saw Byzantium at 9PM on December 31, and it was a great, low key vampire flick with feminist themes and unexpectedly emotional moments. Yet another indie vampire flick that had more introspection and less sparkles. I don’t think Tilda Swinton can do anything wrong, and my interest in Tom Hiddleston grew as I watched him play a bored, timeless vampire musician. This is a quiet film without a lot of flashy set pieces or action, but it was still a great character drama. The opposite of quiet character drama, Snowpiercer is a crazy, flashy series of set pieces and madness. The setup of the film makes little sense, so don’t think about it too hard, but the number of genuine surprises kept me on my toes and enjoying every moment of this weird little movie. I nearly forgot this movie came out in 2014. It just feels like it’s been around for ages. There is so much nostalgia wrapped up in this movie for me and I love that it’s a cultural touchstone I can share with my niece and nephew. It’s an animated movie with heart that doesn’t just seem to pander to the common denominator. Plus having the Lonely Island rap in the theme song was a move of genius. This is the part in the count down where I declare that Marvel won the year. My top three movies from 2014 are all Marvel-related, which either means I’m really an 8-year-old boy or I just like fun movies that make me forget about the rest of the world for a little bit. I’m leaning towards that second reason. I loved all three of these movies for different reasons and will happily watch them all back-to-back-to-back at a moment’s notice, so I can’t rank them in any particular order. Woobie!Bucky! Falcon soaring! Cap beating up all those guys in the elevator! Black Widow being awesome! Pelvic sorcery! Starlord’s dance off! The awesome soundtracks! BAAAAAAAAAAAYMAX! These three movies made me feel warm and cozy in all the best ways while keeping me captivated on third, fourth and fifth watch. Baymax in his bright orange battle armor keeps vigil on my kitchen counter while my admiration for both Chrises knows no bounds. Marvel can do little wrong in my book even though I’m not blind to the issues with the female characters in Guardians. I just choose fun over annoyance and these three films all have so much heart, adventure and fun in them. I still haven’t recovered from this demolition of not only my childhood favorites, but also a resurgent in an adult guilty pleasure. I’ve come to really enjoy the current Teenage Mutant Ninja Turtle cartoon, and this movie version was such a disturbing mess of terrible plot devices, destroyed canon only to be replaced with nonsense, and just general terrible life choices by everyone involved with this picture that it made me want to cry. Don’t even get me started on all the demolished and pasted together backstories that made absolutely no sense. I know I wasn’t the target audience for this film, but it still shouldn’t have been so bad that it made me feel a bit murder-y by the end of it. I’m always bothered by people who do best of lists before the year is over. What’s to say you aren’t going to read the best book of the year on the very last day of the year? That’s why I always wait until January, at which point people probably don’t care anymore because they’ve already seen a million and one best of lists. Well, here is one more. Last year I only read 79 books, including many comics. This is partially due to a lethargy that took over the last quarter of the year that made me slow at everything and partially due to a giant leap in job duties that took up some free time. Despite that, I read 24,701 pages last year, which isn’t nothing to frown on. Of the 79 books, I rated 20 of them 5 stars on Goodreads and another 42 as 4 stars. Not too shabby of a year. I ended up re-reading 3 books (all graphic novels) and they all landed on the 5 star pile. So which were my favorites? I want everyone in the world to read and love this book as much as I did. I was so in awe of Carey’s writing and plotting, so surprised by plot twists that I had a happy post-read afterglow for days afterwards. I want more books like this in the world – standalones full of heart and surprises and emotion and not skimping on the action either. Marissa Meyer is my favorite YA author hands down. I think there’s no way this series can get any better and then, somehow, it does. Meyer was juggling a ton of characters in this third volume and yet I didn’t feel as though any one character was jipped. I wanted to spend more time with everyone and continue their space adventures and fight against the Evil Queen Levana. This is a series that I think about a lot between books and can’t wait to get a double dose this year with Fairest and Winter. But then it will be over and I will be sad and I will buy anything she ever writes for the rest of time. I’m pretty certain this is the best comic series I have ever read. Gabriel Rodriguez’s art astonished me from beginning to end, and together with Joe Hill, gave me nightmares for days. I’m thankful Fernando suggested I read the last volume t home instead of on an airplane to Comic Con because, by the end, I was full on ugly sobbing. These guys deserve all the accolades that can be given to them and then some. Speaking of nightmares, Daniel H Wilson once again manufactured many of mine this year. I never dreamed a sequel to Robopocalypse would exist, but man, am I glad it does. It feels real and surreal and crazy all at the same time. I would not want to live in Wilson’s world, but I really love visiting it and revealing in the victories and commiserating in the defeats. Forget Song of Ice & Fire. Give me Marie Rutkoski’s romantic fantasy realm of a general’s daughter and her mysterious slave boy getting in above their heads. Rutkoski’s writing was beautiful in its descriptiveness while pacing rarely let up. With so many series ending in 2014, I’m so glad this one started. In 400 pages, Blankman reignited a love of historical fiction in me that I had forgotten for nearly a decade. This is a delicately weaved tale of family and love and doing what is right when it’s by no means easy. I’ve always been fascinated by stories of the home front during World War II, but this gave me a fictional glimpse at what it was like on the other side before everything exploded. I can’t wait for the sequel. Ignore the title and ignore the cover. What is between the pages of this book is so much more than the sum of its exterior. I had such a hard time putting down this near-future sci-fi standalone full of mystery, weird secret societies and an app that makes every decision for you. Life at a freaky elite boarding school and the technology ruling the students’ lives makes for one compelling read. I was disappointed with one series ender after another in 2013. Luckily that wasn’t the case in 2014. While it’s the only book on the list that is a series ender, man, what an ender it was. There were tears and cursing and white-knuckle gripping of the book. I still can’t believe what Susan Dennard did to me through her characters. I don’t know if I will ever get over that ending, though she has officially landed on my list of “automatically buy all the books no matter what”. My favorite books either leave me dreamy for a fictional world or leave me clutching the blankets in terror it seems. The Rule of Three was too realistic in its depiction of how society will fracture after a catastrophe like the complete loss of electricity. It stuck with me for a year and has made me both eager and terrified to read the sequel. If the world as we know it ends, I hope a level-headed kid like Adam lives in my neighborhood. Who knew coming home could be so fulfilling? I might not be an emo, manic depressive teen with dreams of great adventures anymore, but returning home to Francesca Lia Block was just as exciting and welcoming in its subversive weirdness as it ever was. Block is not to everyone’s taste, especially anyone who doesn’t like weird drug-fueled psychedelic dreamscapes filled with manic pixie dream girls, but it still feels like home to me. I read a fair amount of comics in 2014, but my reading timeline shows a strong turn towards the Marval NOW! line of books around mid-summer after reading tons of DC comics that left me feeling bleak and mildly disgusted in some cases. First came Hawkeye then Captain Marvel then Guardians of the Galaxy, Young Avengers, Loki: Agent of Asgard, Black Widow and more. I might not always know what’s going on because I lack background, but I always have fun with Marvel’s latest lines so far. I already have a long list of Marvel books to pick up this year. Compared to DC, the Marvel universe is full of so much fun and adventure and no one is trying to chop Batgirl’s legs off or skin the faces of everyone Batman loves. Sunshine can happen to superheroes too, you know. I called the big “reveal” mid-way through chapter 2 and just ended up hating all the people in this book to the point that I wanted everyone to end up at the bottom of the river. I’m definitely not the target audience and I might have to stay away from this sort of “marital crime” sort of books in the future because it just made me grumpy and angry for awhile. Of course a lot more books came out last year, so what are the glaring omissions from my list? What 2014 book should I bump up on my TBR list this year? I actually hit my goal of reading 100 books in 2013, barely squeaking out that last book just a day or two before the end of the year. Despite the long list of reads, I found myself having a difficult time remembering enough awesome books I’d read to justify a Best Books of 2013 list. Nothing immediately jumped to mind like with last year’s list when Feed, Robopocalypse, Dearly, Departed and Cinder refused to let my brain go months after reading them. Of the 100 books I read, I rated only 1 with a single star and five others with 2 stars. That seems pretty good, right? Another 26 got three stars, though looking at the list, some of those might need to be demoted. The bulk of my reads got 4 stars with 44 books landing in that category. And yet there aren’t that many in the list that I would be happy to revisit. What was even more bizarre that, of the 24 books I rated 5 stars, not many of them truly got me excited to write another word about them. Most of the year was spent reading the second books in series that didn’t live up to their predecessors or the final books in series that just made me depressed with boredom. Despite that, I was able to pull together a list of 8 books that I could honestly recommend with a happy heart and a clear conscious. 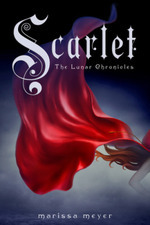 Scarlet by Marissa Meyer – This was one of only three books that came to mind when I started to compile this list. I was happy to find that Meyer recreated the magic of Cinder despite adding an entirely different story line and a new set of characters. It was difficult to put the book down from beginning to end and it even distracted me from an on-going illness, so you know it must have been good. Something Strange & Deadly / A Darkness Strange & Lovely by Susan Dennard – I thought I’d read SS&D ages before, not as my first read of 2013, but Darkness was going to be on this list anyway. Dennard created a new sort of zombie thriller with steampunk elements, highly amusing side characters and a truly amazing heroine with a mind of her own and an attitude that was a match to any of her male counterparts. Though Dennard made me wait 200 pages until the dashingly ungentlemanly Daniel made an appearance in the sequel, it didn’t dampen the fun and excitement of the story. I have high hopes for the final book in the series and hope it will break me out of the series ending blues I’ve found myself in. The 5th Wave by Rick Yancey – The world needs more alien books where the aliens are both creepy and yet certain “bad guys” are steeped in shades of gray. Yancey got my heart pounding and in return I beat the book against my couch repeatedly in my strange way to encourage the characters to RUN FASTER. Despite being the first of a series, there were answers without the explanation police stepping in and yet still so much mystery that I need more NOW! Between Two Thorns by Emma Newman – I discovered Angry Robot publishing in 2013, which is probably the most fortuitous moments of my blogging career. Though vN and iD didn’t make this list, they were some of the most unique and intriguing reads I’ve set my eyes on in ages. Newman’s start to her faerie series, The Split Worlds, left me a little speechless with its vivid world building and her ability to somehow make faeries living concurrently with the real world make sense. It was one of the books I truly couldn’t put down. I can’t believe I haven’t made it on in the series, but that’s definitely a goal for 2014. Three by Jay Posey – Speaking of Angry Robot, I couldn’t leave this book out of my top of 2013 with a clear conscience. I was blown away with this book and Posey’s narrative style. It is nothing like I’ve read before and takes played out tropes from horror and western genres to mold them into something new and creepy and exciting. And then the ending knocked me off my feet, leaving me stunned and with no idea of where this series is headed. That, of course, just left me wanting more. 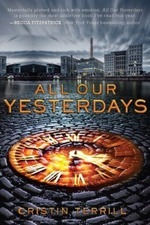 All Our Yesterdays by Cristin Terrill – Another book where I had no expectations or idea where things were going to go. That worked out for the best with this twisty time travel story that actually made sense. I wasn’t really able to write much of a review of the book back in August and I write one now because this is one book best read blind. Having no idea what to expect or any preconceived ideas on plot made this an incredibly pleasant surprise. Crown of Midnight by Sarah J Maas – I wasn’t overly enthusiastic for Throne of Glass, probably because by the time I read it, the entire blogosphere was going nuts over it and too many people were comparing it to Game of Thrones. Despite that – because I am a completest that can’t stop a series in the middle – I picked up the sequel and was delighted by its mix of romance and wizardry. Putting Celaena in the awkward position of working for the man she hates most while she falls for the head of the guard made for an exciting set up. COM built extensively on the mythology started in TOG, which combined with the action to become a fun ride full of adventure and drama. Wonder Woman by Brian Azzarello & Cliff Chang – What is a favorites list without one comic series? I read a lot of DC comics this fall, catching up on all my favorite characters’ adventures in the New 52. Unfortunately the Bat Family stories got incredibly convoluted and twisted together, and while Batwoman and Nightwing remain my favorites and Batman & Robin started winning me over towards the end, it was Wonder Woman that really surprised me. 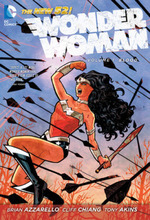 Azzarello and Chang surround Diana with mythological gods and fantastical wars between super-powered deities to great and surprising effect. It thrilled me while at the same time making me depressed that no one seems to be able to create a viable film showcasing the awesome that is Wonder Woman. This is unlike any of the other DC comics I picked up this year and it benefits from going a little out there. In retrospect, my reading list for 2013 was severely lacking in science fiction, which could explain my general blah-ness towards the year’s books. It’s all heavy on YA romance fantasy, so perhaps some adjustments will have to be made for 2014. What are some of your favorites from 2013? I need some great books to add to my 2014 TBR mountain. I may have had a cocktail with dinner and it may have been a bit stronger than expcted. I may be a little inebriated. Prior to said cocktail, this was going to be a Cumberbatch-free zone considering we've been missing Random Tuesday for a few weeks now. But now I'm tipsy and can't make any promises. Yeah, that didn't last long. We haven't been hit by the Icepocalypse of North Texas, but it is too cold to go outside unless you really, really have to. This advice from the ladies over at Epic Reads is definitely accurate, especially if you're stuck at home. 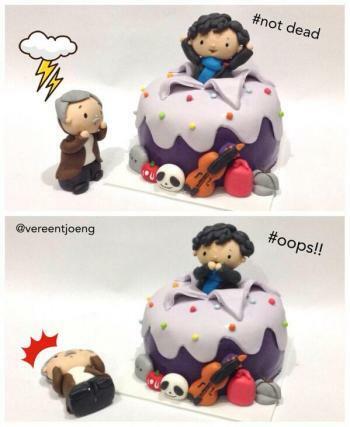 There is someone on Twitter that makes Sherlock and Cumberbatch adorable cupcakes. I swear this was going to be a Cumberbatch-free zone, but the alcohol seems to have attracted him. These were created by @Vereentjoeng over on Twitter and I stumbled upon them through Tor's FB account. Barnes & Noble have compiled 9 ways to know if your life is really a YA novel. What an animated version of Wicked could look like if only Disney had the rights to it and gave it to this guy. I think that's enough from me. Have lovely week and share your favorite random things in comments! It's been another crazy few days and I'm once again coping out with a meme, but it's one of my favorite - the seasonal TBR list. I did pretty well with my summer TBR list, reading 6 of my 10 planned reads. Maybe I'll do better for the fall. Hosted by The Broke and the Bookish, this week’s subject is the Top 10 Books on my Fall TBR List. Cress by Marissa Meyer – I’ve been holding this one since July and I don’t know if I can hold out for much longer. I need more Cinder! Sever by Lauren Destefano – It’s time to finish out some of the series I’ve started, but haven’t read the last book. I have this one from the library, so I hope it has a somewhat happy ending. The Girl of Fire and Thorns series by Rae Carson – I just started this series and I plan to binge read it. Midway through the first book and it’s interesting. Avalon by Mindee Arnett – One of my most anticipated fall/winter releases behind Cress. I won a copy from the author and can’t wait to read it. The Brokenhearted by Amelia Kahaney – HarperTeen was kind enough to send me a review copy of this odd real-life take on Mary Shelly and Frankenstein. It sounds pretty awesome. Allegiant by Veronica Roth – It's probably on everyone's list, but I threw Insurgent across the room when I finished it. I need to know how it ends! Steelheart by Brandon Sanderson – I’ve been a bit obsessed with this book and it’s amaaaazing cover since Comic Con. It sounds like it’s going to be exciting and maybe even something unexpected. For Darkness Shows the Stars by Diana Peterfreund – This cover is so pretty and everyone loves it. I’m ready to dive in now that the sequel is coming out too. These Broken Stars by Amie Kaufman & Meagan Spooner – Another highly anticipated fall release. This list needs some more space in it. A Feast for Crows and A Dance with Dragons by George RR Martin – I promised Fernando I would read these two back to back and before season 4 of the show comes on. Considering how huge they are and how people have said they drag, they aren’t high on my list. What books are you looking forward to reading as the weather gets chillier? How many people want to tear down walls to get Allegiant or Cress? I don’t participate in Top Ten Tuesday very often, but I saw a headline in my feed saying that today’s subject was blending two of my favorite things and I knew I just had to join in this week. Hosted by The Broke and the Bookish, this week’s subject is the Top 10 Books I’d Love to See as a Movie or TV Show. So if you’ve been around here for a day or two, you might have realized that I loooooooove television (almost as much as books!) and I’m pretty fond of movies as well. So these are the books I’d love to see translated on the screen, hopefully in a way that would make me watch them over and over and over again. I’m excluding some that are in the works already, like Robopocalypse, The 5th Wave, The Giver and American Gods. The Dearly Departed series by Lia Habel – I think this would be top of my list at all times, partly because a television show or movie series would probably mean that Habel would finish the series instead of leaving it in limbo as it currently stands after two books. But mostly it’s because Bram the Zombie Soldier stole my heart and I need him on screen to demand it back. The Lunar Chronicles by Marissa Meyer – These books are made for movies and a cyborg Cinderella story is seriously missing in today’s cinema. Studios like to rehash faerie tales. Take advantage of a series that gives those stories a cool science fiction twinge. The Parasol Protectorate by Gail Carriger – The BBC needs to buy the rights and create a Downton Abbey with vampires and werewolves series. Alexia Tarabotti is made for television and with the witty sense of humor, the fun take on monster tropes and the steampunk elements, this could be a hit. Something Strange & Lovely by Susan Dennard – More zombies. I’m getting predictable, I know. I just want to see Daniel and Eleanor on a screen being snarky at each other and then passionately making out under street lamps in a steampunk-ish Victorian-era Philadelphia while hordes of vampires terrorize a public that pretends they aren’t there. Locke & Key by Joe Hill and Gabriel Rodriguez – The shadowy powers that be tried making this into a series, but the stupid powers that be at FOX didn’t pick it up. It was passable, but this spooky series deserves an equally dark show or movie that explores the fantasy elements as well as the horrors while keep intact the underlying story about a broken family fighting to stay together. There is so much fantastic material here to explore. Y the Last Man by Brian K Vaughan – SOMEBODY MAKE THIS A MOVIE BEFORE ZACH LEVI IS TOO OLD, DAMN IT! Feed by Mira Grant – Zombies are in, so it could be popular even though it’s nothing like any zombie book I have ever read. It’s a political mystery with zombies at the background. Mostly I want it to be on film, so that they film that one scene that still brings me to tears thinking about it a year later just so other people would understand my pain. 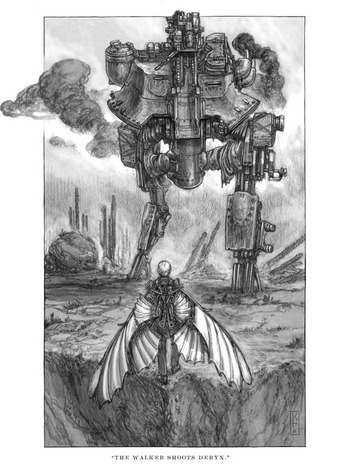 Leviathan series by Scott Westerfield – Steampunk robot machines (see pic on the right) on one side, amalgamated animal monsters on the other, two spunky protagonists to spar between and the backdrop of an altered World War II. It would be a brilliant trilogy of movies with a solid beginning, middle and end. Thursday Next series by Jasper Fforde – Think Once Upon a Time but with characters from classic and not-so-classic novels, time travel, a smart and tough lead female with a pet dodo bird and a world where bizarre is the norm. It would be AMAZING! House of Leaves by Mark Z Danielewski – Forgive my cursing, but this entire book is a giant mindfuck that left me dazed, confused and a little scared during a time I lived far from home and away from everything I knew. I can’t fathom how it would translate onto screen, but it would make for one tense thriller/horror thing of crazy. If you had a bucket full of money and a studio to produce your every whim, which book or series would you put on the screen?